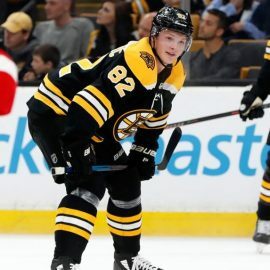 BOSTON – The Bruins had a new face in the mix on Monday as they returned from their eight-day, bye-week reprieve, with former first-round pick Trent Frederic recalled from Providence and ready to make his NHL debut on Tuesday night against the Winnipeg Jets at TD Garden. Frederic skated in 37 games for the P-Bruins this season – his first full professional campaign – tallying 10 goals and 17 points. The 20-year-old St. Louis native had a particularly strong weekend in Providence, picking up two goals and an assist on Friday night in a 5-3 win over Charlotte, while landing six shots on goal over two games. “Probably the last month I thought I’ve been playing well, pretty strong…full games, not just periods here and there, I played well,” said Frederic, who credited Providence coaches Jay Leach and Trent Whitfield for helping him adjust to the professional level. Frederic manned the middle between Danton Heinen and David Backes during Monday’s practice, making the former University of Wisconsin standout the latest to get a shot at solidifying the Bruins’ third-line center role. With Frederic recalled, Jakob Forsbacka Karlsson was assigned to Providence after notching three goals and eight assists in 28 games with the big club this season. “I thought JFK was improving as well, but not to the point where we felt we couldn’t make the switch and it hurt the hockey club,” said Cassidy. “So we’re gonna take a look at Freddy. A little bigger opponents [Tuesday with Winnipeg], Washington Sunday, Philly [on Thursday], so might be a good time to look at him while he’s playing well and the opponents [coming up]. The next two games are at home, we can control a little bit of that.